15 Years of experience. Thousands and thousands of happy customers and happy stories. We were here before brazilian waxes were polular. We love what we do and we train hard to make you happy. No other place comes close to our expertise, quality and and true care. Give us a call or book online, for a true professional experience. Do you want to book and appointment Online? Customer Reviews	We love our clients! I had the best waxing experience ever. It was my first visit and Pia took the time to discuss what I wanted to see in my brows. Then she took the extra time after to show me what she did and explain why/where we were going to let the hair grow. My eyebrows have never looked this good. I am looking forward to more great waxing experiences and also expanding the services I use. The Pia team is absolutely fantastic. Once I arrived, the front desk staff presented a warm and welcoming environment. During the waxing, the ease of conversation coupled with the professionalism of the technicians are the reasons I continue to come back to Pia time and time again. Looking forward to my next appointment! The best! She is always personable and takes the time to make me feel comfortable. I drive from South Tampa just to have her do my eyebrows. First time with a different. They all are very professional and do an excellent job. I already booked my next appointment with her! 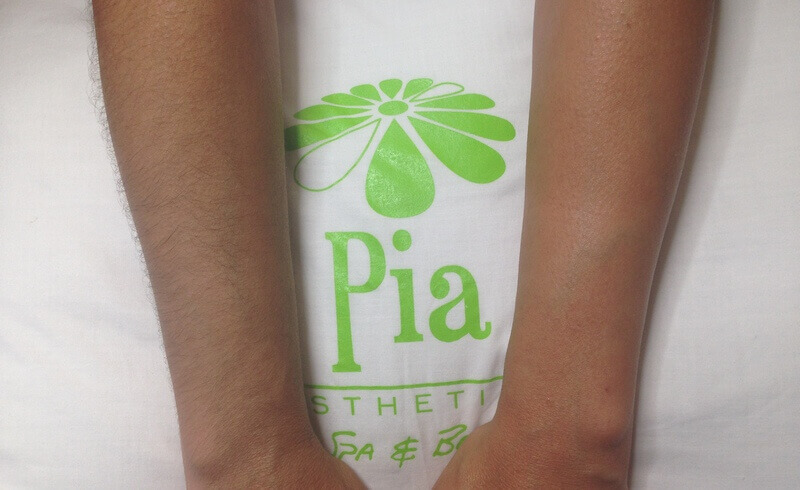 Pia thank you for always taking such great care of me! ! Your waxing never hurts! You staff and spa are first class! I had a wonderful experience when I came for my 1st visit. Ashley was very professional and put my mind at ease. I would definately recommend Ashley. :) I came in for my 2nd visit and had Nayla. My experience was equally as wonderful as my first. Nayla made me feel welcome and provided me with a quick and nearly painless eperience. I have an appt today and I will continue to come to see both Nayla and Ashley. They are wonderful! I have had experiences with a many folks at Pia and a few services beyond waxing- and all have been great. They all know what they are doing and are good at it. They strive to make sure you get the best service- no matter what the service. I recommend Pia to many friends and family. you won't regret it at all no matter who provides the service at this Pia. My facial was very relaxing and fantastic. I also got my eyebrows tinted and waxed. I appreciate how knowledgeable my technician is about skincare. I was having a problem under my eyes with dehydration and she offered her opinion as well as some sample products to help with the problem. I absolutely love my eyebrows! I strongly recommend her to my friends for her professionalism and her knowledge of skincare. My facial was a wonderful experience. second one this week. Both technicians did what they could to reduce the pain. Also, both did a great job of explaining the hair cycle and after care. Very happy with both ladies and Pia's in general. I had a great experience with Pia at the Westchase location. She was professional and made me feel very comfortable. The salon staff was very helpful and the salon itself was very clean. I would definitely recommend the services provided here to other friends and family and will return for the same and new services in the future! Very professional team of experts. I left very satisfied of my treatment. The waxing was minimal discomfort and was done fast. Very clean facility and very kind team. I'm coming back for my treatments as a loyal customer. I always adore my time at Pia's. They are professional, friendly and personal! A day at Pia's Spa is always my go to when Iâ€™m feeling like a need a refresh. My skin always thanks me after! As always I have nothing but great things to say about my experience. Emmy was great as usual, and the receptionist was very nice as well. My friends think I m crazy to drive all the way from Largo, but I think I d be crazy not to! Contact us	How can we help you today?